From immediate action when you have an unexpected broken window, to dealing with annoying misted or fogged window units. Falcon Windows are here to help. We might not be doctors, but we can fix your window pane! Don't panic! FALCON will fix it! 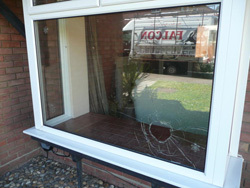 Falcon Glass are glass replacement specialists in Ipswich, Woodbridge, Felixstowe, Hadleigh, Stowmarket and Suffolk. Boarding-up and replacing broken windows and shop front windows in Ipswich, Felixstowe Stowmarket, Woodbridge and Hadleigh round the clock, 24/7. 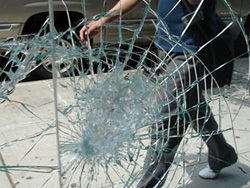 Broken glass a problem at your property in Ipswich, Stowmarket , Felixstowe or Woodbridge? Let Falcon Glass & Windows make your place secure again and replace the broken window within a sensible timescale. We offer a full glass replacement service to homes and businesses in Ipswich, Felixstowe, Hadleigh, Stowmarket and Woodbridge. What's more, we pride ourselves in getting to our customers within the hour to either replace the glass or safely board up the broken window or door. We are well known as one of Ipswich's professional glazing companies and our Ipswich-based glaziers are keen to resolve your issue as soon as possible. As respected replacement glaziers in Felixstowe, Woodbridge, Hadleigh, Ipswich and Stowmarket we will always try to get to site within the hour. It was pleasing to hear from one of our customers how they felt that we had given them "the best professional service in Suffolk for emergency glazing repairs". We tidy up all broken glass inside and out and leave your property or business in a safe state ready for the replacement glazing. We understand that you are after a quick response time for your window to be replaced swiftly and efficiently. 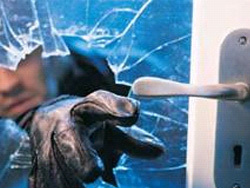 We offer insurance companies special rates for burglaries of properties where the window or door has been broken into and requires a full replacement due to the frame being damaged. We can even bill your insurance company direct to save you the hassle of settling our invoice. If you're unfortunate enough to get burgled, then don't press the panic button call Falcon. For a professional, 24 hour emergency boarding-up service in and around Ipswich for broken windows or doors, contact 01473 288690 or our emergency number 07887525155 for immediate service. Falcon Glass offers toughened safety glass in Ipswich and across Suffolk at competitive rates, with very keen turn-around times.We stock and are installers of safety laminated glass to local businesses, replacing broken windows in the shortest amount of time, so they can get back to business as soon as possible. Many shop fronts still have 6mm and 10mm float glass today - that's very unsafe glass, if broken. Regulations stipulate that all replacement glass nowadays must be laminated or toughened. We supply and install all types of 6mm mirrors for pubs, clubs and fitness gyms in Ipswich and Colchester, making sure that they are all safety-backed with polished edges. Our customers receive the best quality mirrors in Suffolk and a very competitive installation service. When it comes to replacement sealed units, Falcon Glass Ipswich make sure that your replacements are to the exact same specification of glass. We are also sure to clean up all broken glass and make the area around the breakage safe, so no-one can cut themselves in the interim before the replacement is fitted. 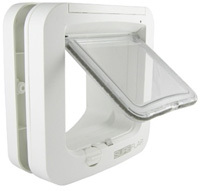 We also fit toughened sealed units with cat-flap holes cut out for your pets. We will survey your French door or rear door where the intended glass unit or panel is to be replaced with a unit incorporating a new white or brown cat- or dog- flap and source and fit the unit accordingly. Falcon glass offers glass shelves for display cabinets in Ipswich, Suffolk and toughened table tops in Ipswich Suffolk for either free-standing tables or for sitting directly on top of a firm wooden surface. These are normally available on a 7-8 day turnaround. For table tops where it is necessary to take a template, turnaround times may be slightly longer: we would normally require the piece of furniture to be brought in to our premises for a template to be made, alternatively a site visit could be arranged at your convenience. We are pleased to provide information about glass and tips for cleaning glass here. Whatever your glass or glazing requirements, Falcon Glass will solve your problem. Call our emergency number 07887525155 for a quick, efficient response. Problems with your uPVC patio doors or patio door wheels in Ipswich Suffolk? Patio door wheels that come adrift or have been dislodged can be an emergency in themselves. If your patio door cannot be shut or locked appropiately, then the security of your property is at risk. Just give Falcon Windows a call and we'll come to your rescue. We'll replace your patio wheels in record time, leaving your door secure and safe again. We also offer a free service to look at problem pvc-u doors, perhaps where the original installation company has gone out of business and customers need them repaired. It's cheaper than a new door! All too often, it's the locking mechanism which is at fault. This is usually very easy to replace, as most locks come with one bottom lock. Need misted window units replaced? Suffering from misty or foggy sealed units in your property in Ipswich Suffolk? Wondering how condensation got inside your double-glazed units? A double-glazed unit primarily consists of 2 pieces of glass held apart around the edge by a (usually silver-coloured) spacer bar. This bar is filled with a desiccant (tiny silica balls similar to those found in parcels) to reduce the moisture levels. In the case of double glazed units, the silica soaks up any residual moisture held in the space within the unit when it is first made. Around the outside of this metal spacer bar, sealant is pumped to seal the unit and complete the process. After time the seal can 'break down', causing a hairline fracture in the seal, thereby letting in air which contains moisture. Various factors can accelerate this breakdown, such as wood frames and putty; poor frame drainage; poor installations not leaving sufficient gap between the glass edge and the frame; locations in extremely sunny positions or where excessive vibrations occur. Once air gets into the unit, the original silica becomes fully saturated and condensation starts to form against the side of the glass as temperatures rise and fall. Unfortunately, it is not economical to repair the units by splitting and re-sealing them. Another method of drilling into the seal of the unit to introduce dry air and extract the moisture from between the glass panes, has not proved to be a permanent solution. This is only a 'temporary fix' as it does not address the main cause of the problem - the fractured seal. Falcon Glass & Windows are specialists in the supply and installation of aluminium shop fronts. These are available in a wide range of colours, although our most popular colours to date are rather boringly black, white and grey! We repair aluminium shop doors that are proving problematic - perhaps shop front doors which may not open quite as they should or which have dropped and scraping on the threshold. As these doors are rather heavy, these repairs are generally a two-man job, but Falcon will come to your aid as quickly and efficienly as possible. We can also replace broken Shop front windows within a few days and offer a same-day boarding-up service to make safe the area for staff, shoppers and the public. What's more, we are on hand to repair cat and dog flaps in Ipswich, Hadleigh, Woodbridge, Suffolk, Stowmarket and Felixstowe, but we find ourselves generally recommending a new one to replace the old for security reasons. If you are looking to replace an existing cat or dog flap within a raised panel in the bottom of a door, it is normally advised to change this for a flat panel so that it can then incorporate the cat or dog flap properly. Pet owners living in and around Ipswich, Hadleigh, Felixstowe, Stowmarket, Woodbridge, Bramford and Suffolk generally appreciate our quick turn-around from initial request to our quotation and subsequent replacement. If you would like the cat flap fitted into existing glass panels, this is not a problem. Falcon will order a replacement sealed unit with the correct size hole to accommodate either your choice or our proposed cat flap. The job is normally done within an hour and as we are local, customers find that our quotes tend to be very competitive. Need a cat flap fitted for your furry friend? Triple-glazing, Caravan Windows, Cabinet Doors - just ask Falcon! 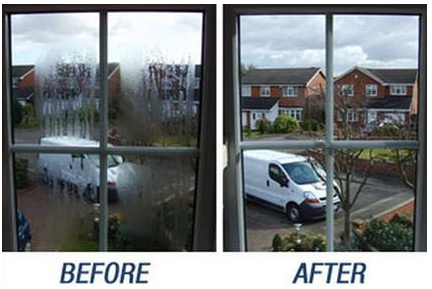 When customers report they have steamed up windows in Ipswich, Stowmarket, Hadleigh, Woodbridge, Felixstowe, WashBrook, or Capel St Mary we normally give a rough idea on cost over the phone subject to survey, but some people take the opportunity to enquire about having their existing double glazing replaced with triple glazing. Although this may sound like a good idea, Falcon generally advises that this is not practical- not only does it put extra strain on the hinges, but there is not really sufficient insulation saving, especially when you take in consideration the cost involved in swapping the units over. Some of our customers have requested that we replace their broken caravan windows in Ipswich, Stowmarket, Hadleigh, Woodbridge, Aldeburgh and Felixstowe. Unfortunately, this is not a straightforward job as the aluminium frame is generally screwed into the caravan and has to be unscrewed and the glass replaced by means of a wrap-around thin black gasket. This can be extremely difficult to put back on, so people tend to bring their caravan windows into Falcon Windows so we can replace on our glass bench. This makes it much easier to have the job replaced correctly. Over the last 30 years we have done many glazing installations in Ipswich, Stowmarket, Hadleigh, Woodbridge and Felixstowe, but found that, generally speaking, UPVC windows have overtaken traditional wooden windows in popularity by far. Apart from being aesthetically pleasing, advantages of uPVC windows include the higher level of security and the better insulation values. Falcon Windows now concentrates on installing top quality UPVC windows in Ipswich at very competitive prices to our ever-increasing customer database. 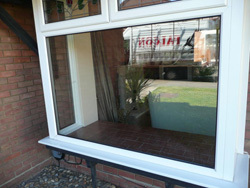 Falcon Glass & Windows are also local Ipswich cut glass suppliers. We stock float obscure and laminated glass that can be cut to your requirements. Our Suffolk-based customers often pop in for a piece of glass, a piece of mirror or if they require a shelf or cabinet door to be manufactured, Falcon can help there too. These generally take 7-10 working days and they come with polished edges and a toughened stamp in the corner. If required we can offer, furniture stamps which are smaller stamps right on the edge of the glass. Turn-around times on processed glass such as polished mirrors, balustrading or swimming pool dividers are normally 7 working days from order. Taking windows out - helping furniture removal in Ipswich Suffolk! Imagine the situation. A wonderful new sofa! But when it arrives at your Ipswich home, it just simply won't go through the front door - or the back door - or the window. Disappointing, distressing aren't even good enough words. But Falcon Ipswich might be. If your sofa is too big, won't fit through door - ask Falcon, the Suffolk sofa access experts, Ipswich's sofa removal specialists. Our special sofa installation / removal service can come to your rescue. Just give us a call and we'll help you to get your furniture back into place in no time. No stress, no fuss - and above all, no disappointment. Our installation team will arrive and remove the sealed unit or entire window swiftly, so you can get your sofa into your room. We will then re-install the panel, clear up any mess, leaving your home looking clean and tidy. If you require a panel of glass, sealed unit or complete window to be removed temporarily to allow big items of furniture to be taken in or out of a property, then Falcon can do this for you. We'll arrange a suitable time when your furniture is being delivered. We can generally do this within one to two hours and at a minimal cost. Please call (01473) 288690 for a free quotation over the phone for this service. At Falcon Ipswich, when we get a call from someone in dire straits like this needing furniture installation/ removal in Ipswich, Stowmarket or Felixstowe, we attend as soon as conceivably possible to help you out. We survey the easiest window to get the furniture through, and inform you of the most cost-effective way of getting the item into your property. If it's possible just to remove a panel of glass - normally the largest panel - then we'll set about removing the beading first. The beading will be either inside or outside, and once the glass is removed we carefully and safely put the unit out of the way onto a wooden surface to protect the edges of the glass. Need windows out, to get furniture in? It's easy just to concentrate on how much space a sofa or new piece of furniture might take up in the room. If you're purchasing a sofa or settee from shops in Suffolk, don't forget to measure up your doorways first and take a measuring tape with you. It's a good idea to measure the width and height of the furniture which you are planning to purchase to make sure it's going to be able to get through either the front or back door. Often, in some period properties or older buildings in particular, the doors are simply not wide enough to get a sofa or settee through. Beds can prove a challenge too. Therefore, it's a case of rethinking how to get that must-have - and no doubt expensive - new settee or bed into your home. If the furniture item won't fit through, then calling out Falcon, a glazier or window installer, to remove either a large panel of glass in the front lounge window - or alternatively have the whole window removed - could be an option. Unfortunately if your property has a 5 part bay window, at least 2 or 3 sections of the bay may have to be removed to allow the item through depending on its size - and that can be quite a costly manoeuvre! Bedroom furniture removal through windows in Ipswich Suffolk can also be challenging as many period properties have older wooden sliding sash windows. These give limited access, especially when trying to get bedroom furniture in or out of them. These days, most beds tend to come in two sections, so they can easily fit through doorways - so it's worth checking whether new furniture comes in sections or has detachable sections at the time of purchase, to avoid disappointment and difficult furniture removal situations later. If you think that you will need a window removed to help your new furniture gain access to your property, have a deliver date and want to get an idea of costs involved, then please call Falcon Ipswich on 01473 288690 for a free quotation over the phone.